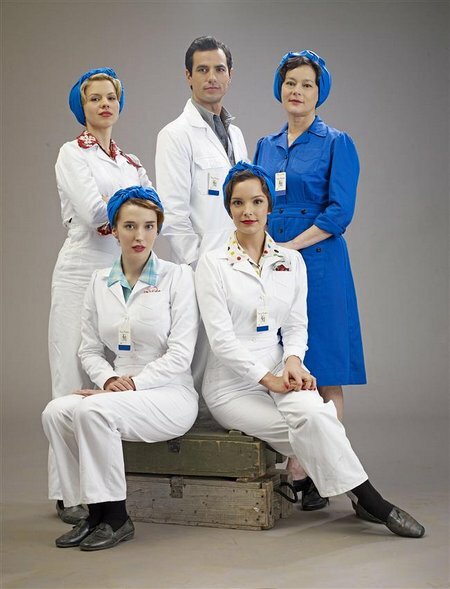 Wednesday night was the series premiere of Bomb Girls, a Canadian miniseries that offers a fictionalized account of the war effort at home during WWII. Set in a munitions factory, the story follows the female workers that keep the factory running while the men are away at war. It’s always a bit scary to watch Canadian television. Canadian dramas can sometimes be a hits, but most often they are misses. Our dramas somehow seem fall short when paired next to the theatrics and set design of American and British dramas. Despite my fears, I decided to give it a chance. As a supporter of the arts in Canada, I wanted to do my part to help boost the ratings on premiere night. One bit of praise for the first episode was that it did a great job in capturing the era. The costumes and hair were appropriate, and that is one thing about period pieces that critics have issues with. The set design was fitting and it did not distract from the performances. It was good to see that Bomb Girls boasted a mostly Canadian cast, or at least a cast that had a lot of Canadian affiliation. It was especially refreshing to see actors with wrinkles and imperfections as opposed to the botoxed and plastic surgery-altered and perfect faces of Hollywood. Although there was much to like visually about Bomb Girls, the writing unfortunately fell a little short. It was almost as if the writers were trying a bit too hard to get their points across. Dialogue was frequent, carefully scripted, and did not flow free. I hate to say it but some lines were a bit cliché and the script as a whole could have done with a little more nuance. Because of this, the first episode had a soap-opera-y feel. The story line of the first episode gave a good introduction to each character, but there was not much action aside from a horrific factory accident that made one of the girls a victim. Meg Tilly plays the lead as Lorna Corbett, the stern factory matron in charge of the safety and productivity of the workers. I couldn’t tell if her acting was good because the lines she had to work with were at times so unbearable. To her credit, she did win a Golden Globe for her performance in Agnes of God. The other standout so far is Jodi Balfour, a South African native who has now made Vancouver her home. Balfour plays Gladys Witham, a socialite who takes a secretarial position at the bomb factory in order to aid the war effort. A character who will be interesting to follow is Kate, played by Charlotte Hegele, a young sheltered woman who has run away from her abusive preacher father. I’m curious to see how they will deal with religion and faith. So far, it has been seen as purely negative but that could change in upcoming episodes. Overall, I think Bomb Girls is worth watching because of the rare Canadian perspective it gives of such a monumental time in history. Interesting issues of race, gender, and class are highlighted so it will be fun to see how these are explored.